Employment Growth of Trade & Logistics Industry Cluster | Propel L.A. 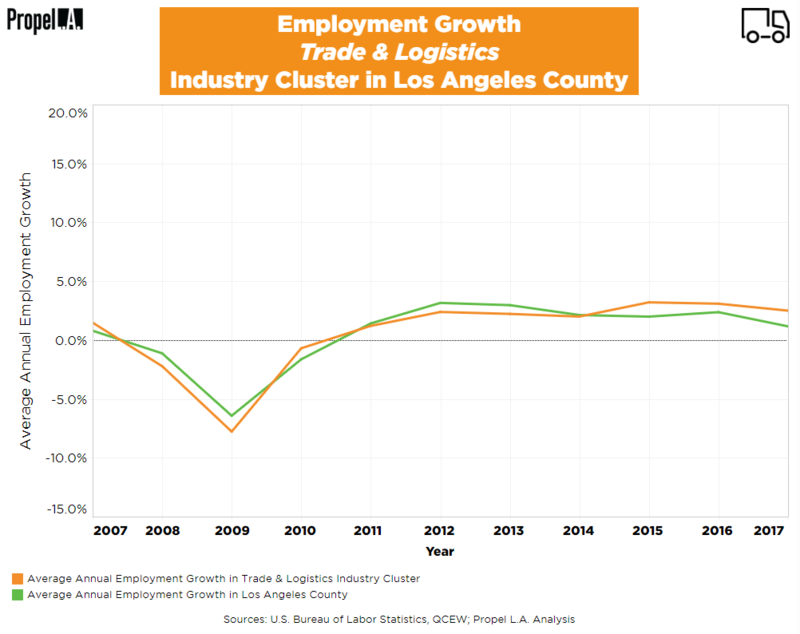 The Los Angeles County’s Trade & Logistics industry cluster (“Trade”) experienced a decline in employment growth from 2008 to 2011 but maintained a steady 2.5% growth rate from 2012 onward. This matches the average employment growth rate of the whole county, irrespective of industries or clusters, represented by the green line. Any rate below 0% on this chart, even if greater than the previous year, still indicates a decline in employment. Shannon Sedgwick, our Senior Economist at the LAEDC, attributed some of the employment growth in the Trade cluster to the “decentralization of warehousing and distribution” and to “major technological advancements in the industry that increase productivity” (Los Angeles Times, June 2017). However, this growth is not without concern. Industry leaders believe that trade jobs will continue to grow but at the cost of wages in certain trade industries. In particular, wages in Warehousing and Storage (NAICS 493) have dropped 9% since 2007. Furthermore, Jock O’Connell, international trade advisor at Beacon Economics, warned that Trump administration’s trade policies could have a substantial impact on this industry cluster. Annual employment growth was calculated by dividing the change in number of employees between two consecutive years by the number of employees in the preceding year within all he selected NAICS industries. Calculations only account for private ownership. NAICS industries were selected by using the definition of the industry cluster produced by the Cluster Mapping Project (CMP) developed by the Harvard Business School. To learn what the Trade & Logistics industry cluster or an industry cluster is, read here.